After I made the Cajun Chickpea Cakes, I wondered why I didn't make bean cakes more often. Afterall, they're so quick and easy! I was rumaging through my fridge for dinner ideas when I found a bunch of asparagus on the verge of going bad. I was also in the mood for something lemony, so piccata seemed like a good fit. I'd actually never had piccata until I was vegan and the one time I tried to make seitan piccata at home was a slight failure. So, I tried my hand at making an easy chickpea cake that could rock out in seiten's place. Shove over seitan!There is a new sheriff in town - the mighty chickpea! 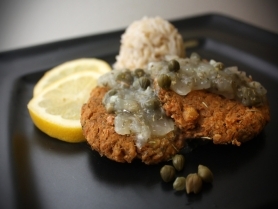 A fat-free and healthy vegan version of chicken piccata. For the chickpea cakes, preheat oven to 350F. Line a cookie sheet with parchment paper and set aside. Place chickpeas in a food processor and pulse about 10 times, until chickpeas are coarsely chopped and no whole chickpeas remain but do not puree. Transfer to a mixing bowl and combine with 1 tbsp poultry seasoning, 1-2 tbsp lemon juice, 1 tbsp tamari, 1 tsp dried parsley, 1/4 tsp garlic powder, 1/4 tsp onion powder and 1/4 cup chickpea flour. Roll 6 balls and flatten gently with the palm of your hand. Transfer patties to the cookie sheet and lightly spray with cooking spray. Bake for 12 minutes, flip, spray and bake another 8 minutes. Meanwhile, prepare sauce. For the sauce, mix cornstarch with 2 tbsp water and set aside. Line a medium pot with a thin layer of water. Saute onion and garlic until soft over high heat, about 3 minutes. Add capers and 1 tbsp poultry spice and cook another 2 to 4 minutes. Add wine and cook until the liquid reduces by half. Add 1 cup water, 2 tbsp lemon juice and lemon zest. Cook until it reduces by half again. Taste test, adding more lemon juice or capers if desired plus salt and pepper to taste. Then add cornstarch mixture and reduce heat to medium and allow the sauce to thicken as desired.